What are ganglion cysts? Ganglion cysts are very common lumps within the hand and wrist that occur adjacent to joints or tendons. The most common locations are the top of the wrist (see Figure 1), the palm side of the wrist, the base of the finger on the palm side, and the top of the end joint of the finger. 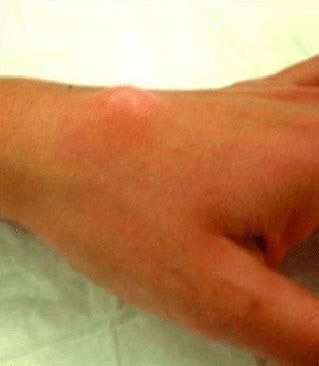 The ganglion cyst often resembles a water balloon on a stalk (see Figure 2), and is filled with clear fluid or gel. The cause of these cysts is unknown although they may form in the presence of joint or tendon irritation or mechanical changes. These cysts may change in size or even disappear completely, and they may or may not be painful. These cysts are not cancerous and will not spread to other areas. How are ganglion cysts diagnosed? The diagnosis is usually based on the location of the lump and its clinical appearance. They are usually oval or round and may be soft or very firm. 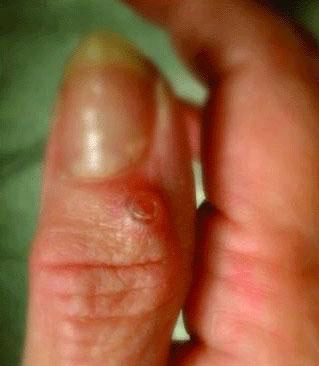 Cysts at the base of the finger on the palm side are typically a very firm, peasized nodule that is tender to applied pressure, such as when gripping. Light will often pass through these lumps (transillumination) and this can assist in the diagnosis. Your physician may request xrays in order to investigate problems in adjacent joints; cysts at the end joint of the finger frequently have an arthritic bone spur associated with them. 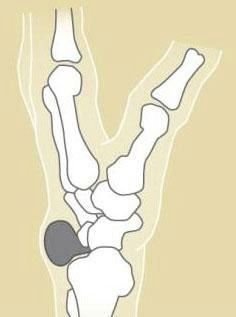 Figure 3: Crosssection of wrist showing stalk (or root) of ganglion. What are the treatment options for ganglion cysts? Treatment can often be nonsurgical. In many cases, these cysts can simply be observed, especially if they are painless. If the cyst becomes painful, limits activity, or is cosmetically unacceptable, other treatment options are available. The use of splints and antiinflammatory medication can be prescribed in order to decrease pain associated with activities. An aspiration can be performed to remove the fluid from the cyst and decompress it. This requires placing a needle into the cyst, which can be performed in most office settings. If nonsurgical options fail to provide relief or if the cyst recurs, surgical alternatives are available. Surgery involves removing the cyst along with a portion of the joint capsule or tendon sheath (see Figure 3). In the case of wrist ganglion cysts, both traditional open and arthroscopic techniques may yield good results. Surgical treatment is generally successful although cysts may recur. Your surgeon will discuss the best treatment options for you.